Anyone living in Michigan knows that winters here can be difficult. When temperatures start to plummet and the wind chill turns frigid, the last thing you want is a broken furnace in your Ann Arbor home. That’s why it’s important to make sure your heating unit is always in good working order. The best way to do this is with a seasonal furnace tune-up from Andy’s Statewide. The skilled technicians at Andy’s Statewide know how to keep your furnace system running smoothly and efficiently. And with a seasonal furnace tune-up in Lake Orion, Detroit, Troy, MI and the surrounding communities, we can ensure your system is in prime condition before the winter weather even gets here. And if there’s a problem with your furnace, we can catch it early and keep it from becoming a big one. How Do You Know If You Need Furnace Repair? Is your furnace or heating system making unusual noises? Are you having difficulty keeping your home warm? Is there weak air flow in your vents? Do your utility bills seem unusually high during the winter months? Has it been more than a year since your last heating system tune-up? Answering yes to any of these questions – even just one of them – means it’s time to have your furnace looked at. And who better to take care of that for you than the knowledgeable experts at Andy’s Statewide? 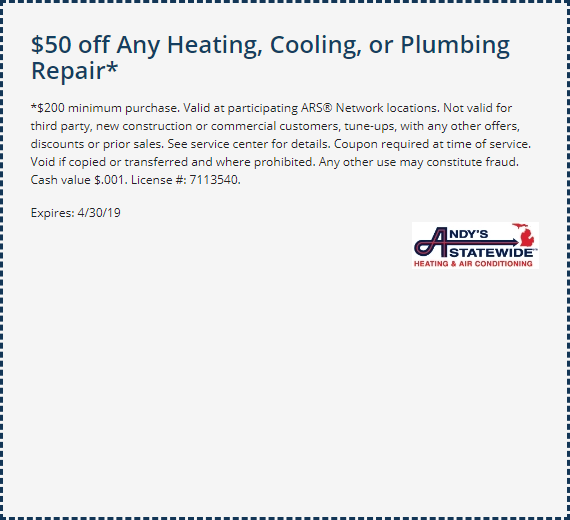 As one of Southeast Michigan’s leading authorities on indoor climate control, Andy’s Statewide has a proven track record of quality Detroit furnace repair, Lake Orion and Troy, MI. All of our work comes backed with our Exceptional Service Guarantee, which guarantees complete satisfaction on your end. Either you are completely happy with the work we do, or we’ll do whatever’s necessary to make it right. There’s no reason to spend the winter shivering indoors. With just a single call to Andy’s Statewide, you can have your home nice and toasty again, just the way you like it.